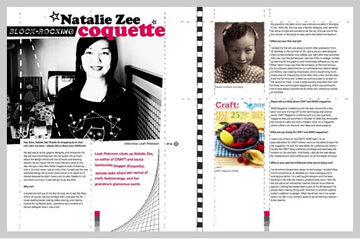 Check out the latest LAB Magazine, issue 01 which has an interview with me from back in Feb where I talk about Coquette and my work on CRAFT with writer/crafter Leah Peterson. This is a great new online magazine that covers everything from art, design, and crafts. You can also order a printed version of the magazine through lulu.com. Thanks Leah and LAB mag! 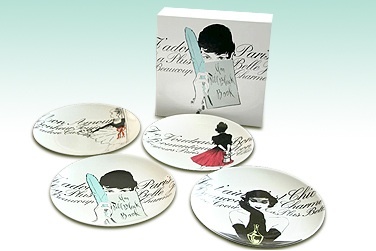 This Les Femmes Dish Set from Delight.com is the perfect set of plates for all you fashionistas! 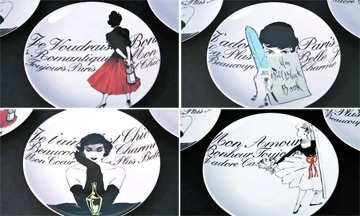 I've seen many fashion style plates before but these ones take the cake for the beautiful vintage style fashion illustrations and the french typography. Oh la la! Serve your special appetizers when the girls come over for wine or use the plates as artwork on your walls. Only $26.55 until 11:59am CST, May 31st but still a deal at $29.50 everyday. Hurry up before time runs out to buy these stylish plates. 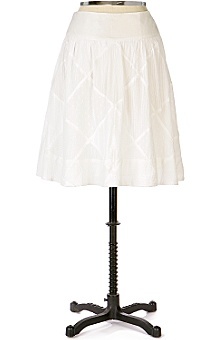 Stripes are all over this season in new modern twists like this Vince Dress ($185 at Shopbop) that ties at the waist. Whether bold or subtle, it's not the boring "jailhouse" look anymore. (Although Paris will have to get used to those familiar stripes or the color orange). There are lots more stripes with interesting cuts or patterns that bring them to a whole new level! I love London. In fact, through my old job I used to go there for work and almost moved there, that is until I met my future husband here in San Francisco. I loved that I was the one with the "accent" and that thanks to my gay friend Paul, I learned the ins and outs of faking a true British accent as well. We'd run to Stella McCartney's botique at lunch or I'd hear the latest gossip about Becks and Posh shopping somewhere around town. At work, I had a view of the London Eye and the Thames river. I also passed Buckingham Palace on the double decker bus as I rode into work. How fun is that? Of course, London is expensive! 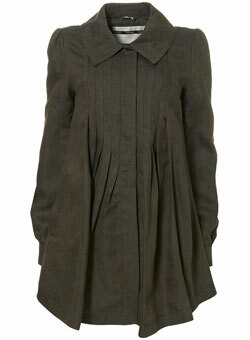 I shopped at Top Shop at the recommendation of Paul's boyfriend who told me it was THE place to shop for young women. I entered the Oxford Circus store with the blasting sound of Beyonce's "Crazy in Love" and realized that I was in LOVE with Topshop. There it was, lots of floors of trendy affordable fashion in a very unaffordable city, I was hooked. For some reason, I remembered that the store was interested or is going to have a store in San Francisco. (Did I dream this?) 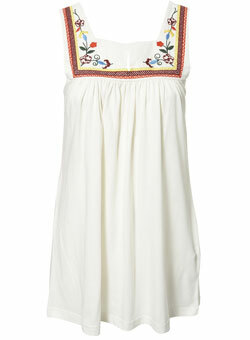 So when I looked it up on Google, I ended up getting a link to Topshop's San Francisco Collection and saw there version of Bohemian Hippies which in some cases looks more Kate Moss than some of the pieces in the Kate Moss Collection. "K" for Kate? 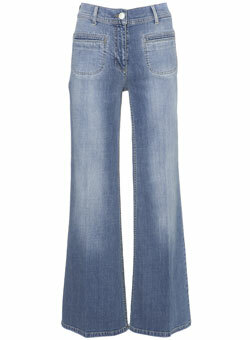 These look just like Kate Moss' jeans posted here! 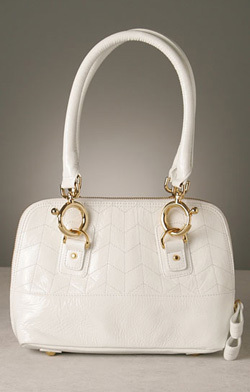 eBelle5 discovers a handful of Marc Jacobs Designer Handbags that retail for under $65. FabSugar's got the fab pick for the trendy luxe baby in your life, Christian Dior Gold Baby Sneakers. Second City Style is making beautiful music with the accordion...pleat this summer. Styleholics: Love the 80's? Love Cassettes? Then you're gonna love these wallets! 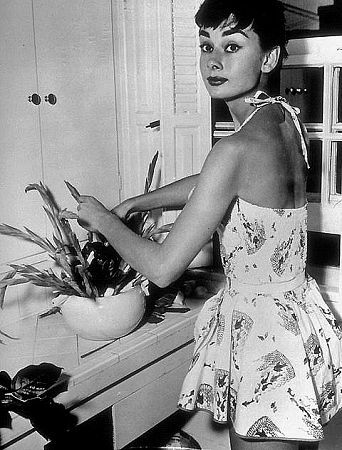 Zzzzzz.....time to catch up on your beauty sleep, advises Fashiontribes. In honor of Better Sleep Month, learn the secrets of a good night's sleep from experts at the Better Sleep Council. Some dames dig dogs, other kittens cuddle cats -- Kristopher prefers glammy dead animals, like a vintage alligator bag. SheFinds: Chic Luggage for Chic Travelers. 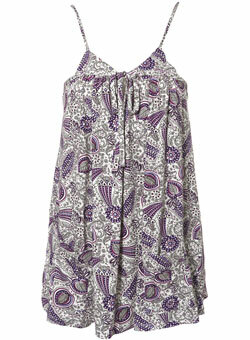 Stylehive has just launched Style Communities with great brands such as InStyle, Gap, Shopbop and Ron Herman! Check them out and join today! 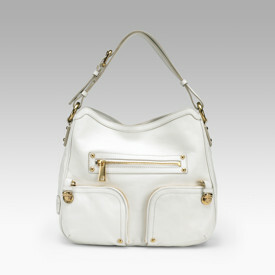 Jewelry gets the bag as The Jewelry Weblog discusses the idea of combining jewelry bling with hand bag function. It's been a crazy week for me recovering from Maker Faire. I had a blast meeting with all the crafters who came out and found out many of you read Coquette! Merci beaucoup! You can read the recaps on the CRAFT blog or check through my flickr photos to see what happened. I am in desperate need of a little R&R this weekend so Coquette will be back up in full swing on Tuesday next week. Have a great holiday weekend! 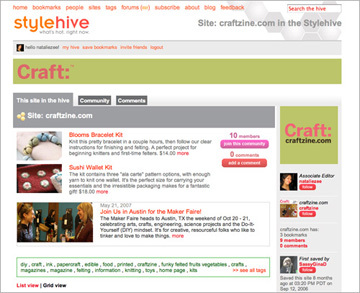 Something I'm really excited about is the launch of Stylehive's new Style Communites. I worked with them to get the Craftzine Community set up. (Thanks Stephanie!) If you're a member, take a look and join the Craftzine Community to get the latest craftzine news and crafty picks by moi! Fellow fashion blogger and friend Nichelle at 55 Secret Street and Anovelista will be on XM Radio on Cocoa Mode airing at 1pm EST (10am PST) and repeats Sunday at 1am EST (10pm EST). Yay Nichelle! Bay Area fashionistas can take a visit to Hayes Valley in San Francisco on Sunday for the Capsule Design Festival where you can shop for Kris Nations jewelry at booth #66, as well as 140 other clothing and accessories designers. Hours are 11am - 6pm on Octavia between Fell and Hayes. 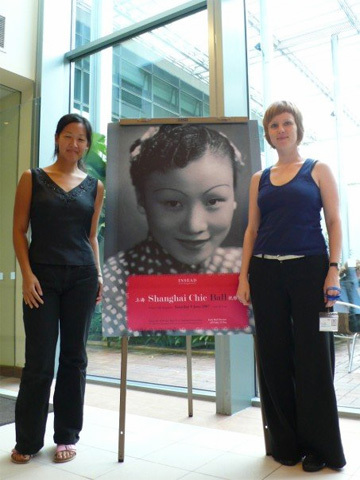 I feel so honored that the top-notch business school Insead in Singapore will be using my grandmother's photo for their Shanghai Chic Ball. Sarah Gill (pictured left) found the photo on flickr and contacted me about using her photo a while back. Pictured right is Rein the graphic designer who put the poster and invites together. The Shanghai Chic ball is June 8th and Sarah will send me photos which I will post up here. I think my grandmother, Amy Wang would have loved that she was chosen to be the quintessential Shanghai chic lady of her time. Thanks for chosing her! If you want to see more inspiring photos of my grandmother, read my previous posts on Coquette about her and see more photos on flickr. If you're tired of looking like every other girl in your city, check out the fresh one-of-a-kind print fashions by Snoozer Looser on Etsy. I found her while surfing for news on the Stationery Show in NY and came across the Oh Joy! Blog. Don't you just love how the Internet works your brain sometimes? 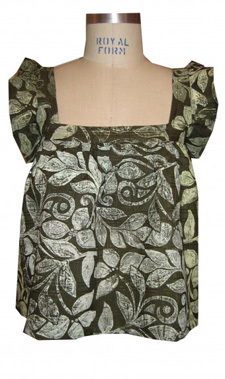 Her designs include hand printed fabrics in a variety of designs and fresh colors. 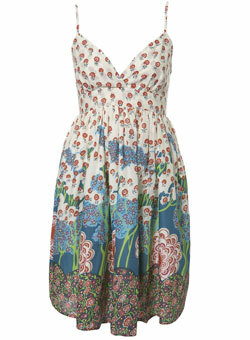 Perfect for taking on the city in hot weather. 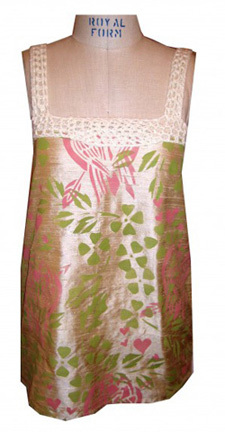 I love The Amelia top ($110) that's hand printed on delicate silk toile with cute gold antique buttons. 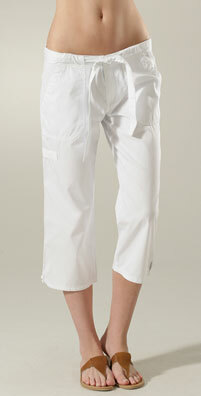 It's that time of year again to wear your summer whites. Even as we are seeing in recent trends that you can wear white year round, I still haven't been able to wear my white pants without feeling a tinge of fear. 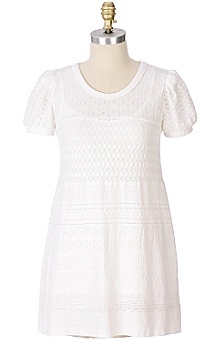 Thankfully, there are lots of great things in white to choose from like this JCrew Pilar Dress ($175) that's perfect for beachy getaways, an outside BBQ, or dinner at an outdoor restaurant. (Then pair up your looks with some clear jewelry. Fashiontribes dives in & finds the Top 10 Glamour Girl swimsuits for splashy poolside lounging, Hollywood starlet style. eBelle5 discovers 5 Designer Laptop Bags at an affordable price. 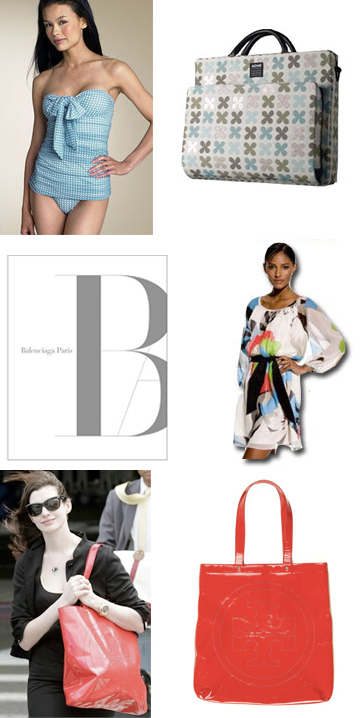 FabSugar's Fab Read: Balenciaga Paris. Second City Style's Must-Haves and Must-Not-Haves for Summer 2007 is a Must-Read! She Finds: Celebrity “It” Bags: Which Is Your Fave? 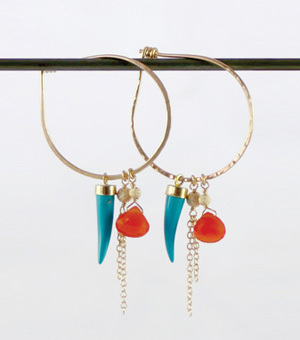 Earrings from Gem make Girlawhirl feel like she's on vacation every time she wears them. YSL Tribute shoe is the perfect platform for Kristopher to preach on. LA STORY muses about taking her iPOD on the run-- with IMainGO! My Fashion Life asks that you take a stand against the disaster that is "Paris & Nicole on the cover of Harpers!" Papierdoll celebrates the arrival of Boots UK to Target. StyleBakery.com tested over 40 products to come up with their list of Top 10 Sunless Tanners, plus they offer 10 Goof-Proof Tips for Getting the Perfect Faux Tan. Styleaholics: Discover hot new sneaker line Jezign! Stripper shoes or top dollar chaussures? Stylebites looks into the case of the catwalk trend! Escape with Stylehive to only one of seven astronomic hotels worldwide, Nuestro Hotel's Elqui Domos, where you can stay in a private dome stargazing with the complimentary telescope. With all the graduates out there right now, don't forget to give them a little something special. The Jewelry Weblog says that message jewelry, in fact, is a great way to show and tell how much you care.